“The ‘Moment of Truth'” explains adidas director of football hardware and footwear Matthias Mecking “Is everything for us at adidas. 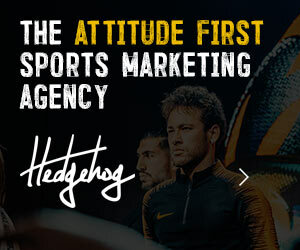 It is the moment when the athlete takes the product in his hand for the first time, and this will largely define whether an athlete likes a product or not”. From here…: adidas’ legacy of great European Championship footballs. 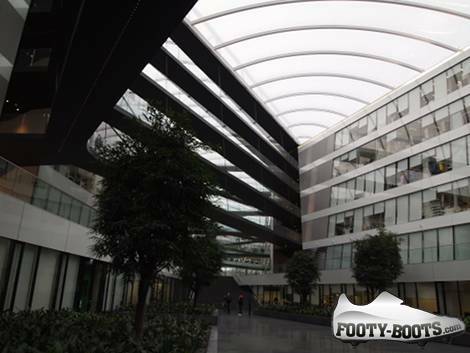 In a small conference room at adidas’ Herzogenaurach HQ, Matthias explains to a select gathering of international media what it means to create products for one of the largest football brands in the world. 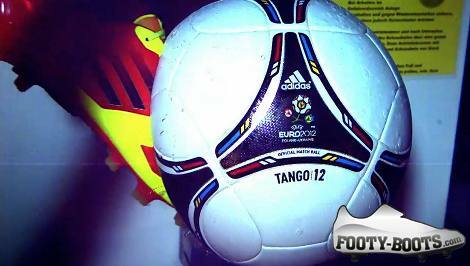 Today, the focus is on the new adidas Tango 12, official match ball of the upcoming 2012 UEFA European Championships – and the sense of pride is palpable. 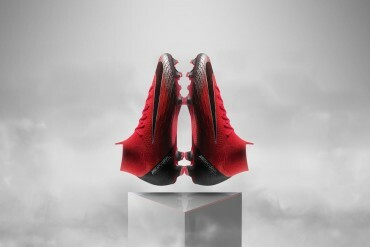 …To Here: The Tango 12 in it’s prototype colourway, for testing purposes. 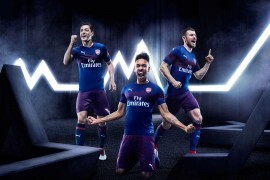 But for all the enthusiasm on adidas’ part, and the wonder of the assembled press – there is still a bobbly, wobbly, elephant in the room; and it doesn’t take long for it to get brought up. Today, adidas are going to do more than just tell us that how they’ve created a ball worthy of the European Championships. They’re going to show us. The first stop inside of adidas’ incredible Headquarters – known as ‘Laces’ by the some 3,000 adidas staff that work here – is a huge room, reminiscent of a small aircraft hanger. Whilst not capable of flight itself, what lives in this vast room is still mechanically impressive, “This is Robi-Leg” Senior Researcher Harold Koeger says, introducing us to what is clearly adidas’ favourite toy. As you’ve probably guessed by the name, this is essentially a robotic leg, capable of replicating more or less any style of kick a player can muster – I ask whether it can knuckle a ball like Cristiano Ronaldo. 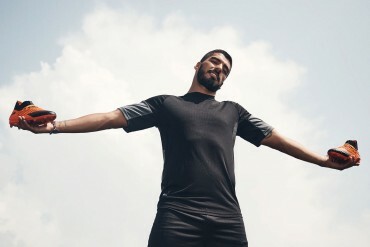 It can (Apparently it is the most consistent free-kick taker in the world). 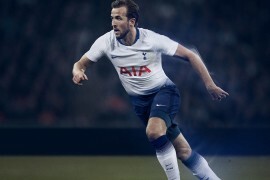 The concept is simple, Harold tees up a ball in front of the Robi-Leg and – bam – it pings it into a goal at the far end of the lab, in the style and into the exact location he wanted it. Pick that one out! The Robot Leg lets fly. 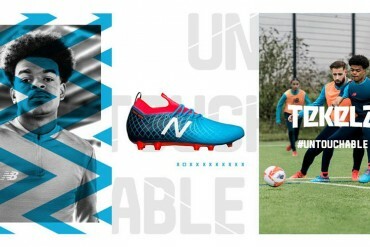 Capable of replicating' different factors including wetness and different football boots (today it’s the new F50 adiZero miCoach), the whole set up is monitored using high-speed cameras and sensors to capture every conceivable metric related to the contact of boot and ball; pressure, ball deformation, flight consistency, spin and' much more. Over consistent testing, the new adidas Tango 12 has been proven to never fly with any more than 40cm variation in shot flight – pretty impressive stuff. 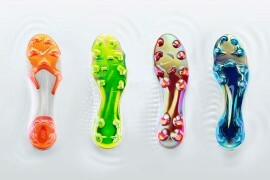 The result of adidas’ high-speed photography is astounding. 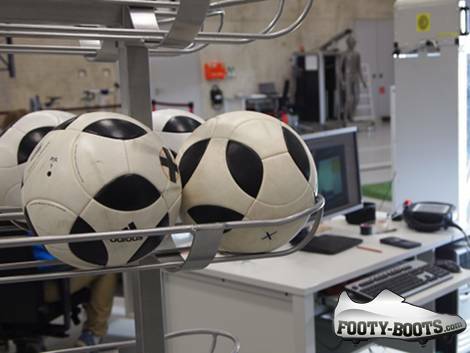 We’re then lead back through the complex to a neighbouring lab, this time an array of alien-looking machinations lay in different corners of the room, each one specially designed to test a humble football to assure FIFA Standard compliance. The rebound test is simple enough, how high will the adidas Tango 12 bounce when dropped from a regulation height? adidas’ researchers can reply instantly – 142cm. They can also tell you the variations based on outside temperature, altitude and the firmness of the surface. Under Pressure: the Tango 12 tested for losses in shape and pressure. Another device is rotating a prototype ball seemingly endlessly, squishing it and squeezing with every twist it in a slightly hypnotic rhythm. The purpose? 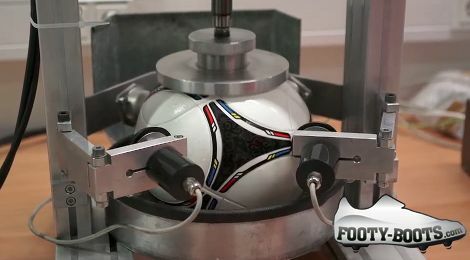 Testing for pressure loss, each twist and squeeze replicates a kick of the ball in a real match, before quickly measuring pressure ahead of the next simulated ‘kick’. 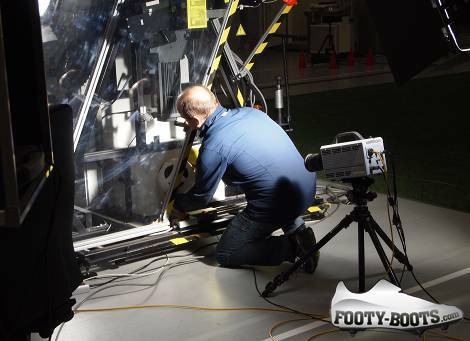 Matthias proudly tells me that FIFA have actually asked for the same machine to be installed in their labs, as adidas’ was better than the one they were using. 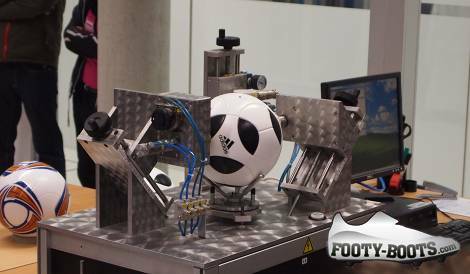 Finally in this lab, a pneumatic plate is rotating and crushing the life out of another poor prototype to ensure that it will always spring back to it’s original form – FIFA’s regulations ask that each ball is capable of surviving 2,000 consecutive pulverisations. This ball in particular is up to 3,500 and shows no signs of giving up the ghost. The final stop on our tour of institutionalised ball destruction takes us to a room with two machines that have to be kept separate from the others. 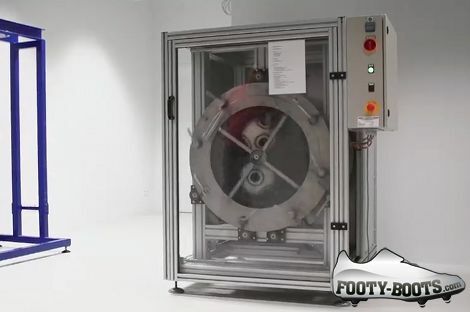 Right now, you’re probably hoping that this is because adidas use these machines to test their balls in a zero-gravity environment, or perhaps some sort of electro-magnetic discharge that proves their soccer equipment can cope with solar flares. I’m sorry to say the answer is rather more mundane; it’s because these two tests are so damn loud. In Layman’s Terms: Speedy Thing goes in, Speedy thing comes out. The first machine is, essentially a cannon. At one end is the cannon, at the other, a solid metal plate. 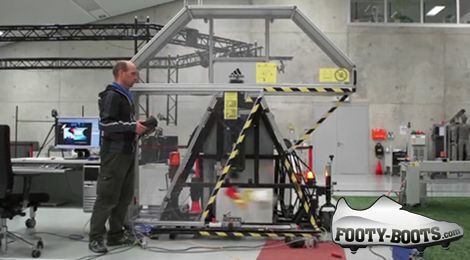 With a test like this, the adidas labs can prove that even when hammering a ball against solid metal at speeds exceeding 100km/h, the Tango 12 will never lose more than 4% of it’s pressure over the testing period. FIFA allow 20%. Topping it all off is something closely resembling a washing machine. Only this one is lined with sandpaper. 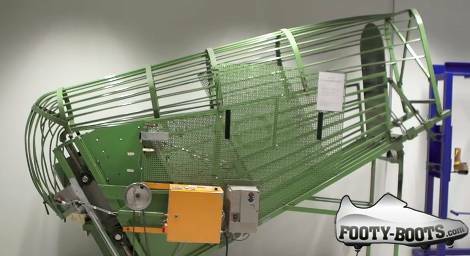 adidas will load this machine up with between 1-3 balls and then leave them for hours at a time. Which FIFA Regulation does this appease? It doesn’t. 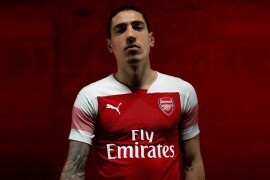 This one is all adidas, making sure that their footballs are capable of taking a hammering on even the most punishing pitches. The only washing machine you’ll ever need. If you really, really hate clothes. 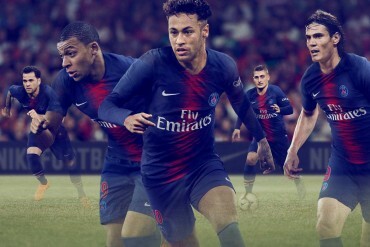 Whatever regulations are laid in front of the adidas team, they’ve gone out of their way to surpass them – needless to say, we’re impressed. 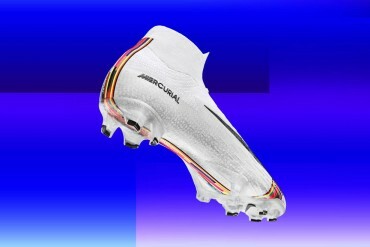 But Matthias is a realist, and knows the adidas Tango 12 will have it’s nay-sayers; the ghost of the Jabulani could still have it’s say on the Tango 12’s legacy. You’ve seen the results of adidas’ lab tests – but what does it feel like to play with? We took to the pitch in Germany with the new adidas Tango 12 – stay tuned when later this week, we’ll give you our exclusive first impressions! 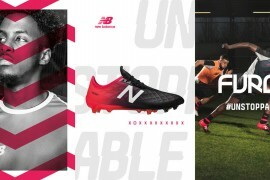 Nike does the similar test when they come up with the ball… different marketing strategies because they do put a lot of research and time into the graphic / visual aspect of the match ball when it actually moves. I’m not good enough to say which ball is better when struck but Nike balls are preferred by players because of their consistency. The new Euro Tango Match Balls seem to focus on their flight since Jabulani and Speedcells got a lot of complaints about unpredictability and grip. 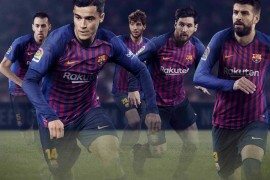 adidas may have messed up like any other product manufacturer in the world like their Jabulani but hell… they innovate and show to the world their quality expectations. 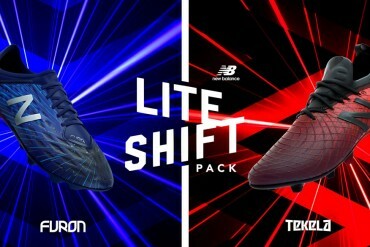 Unlike Nike, adding bulls*** “features” on about color and speed and what not and have no intention of revolutionizing their products other than overpricing them and slapping on new colors, sad really. 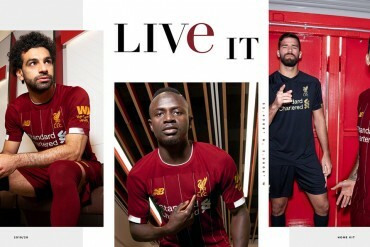 it looks similar to the Europa League ball last year but it’s not, i saw the same thing. 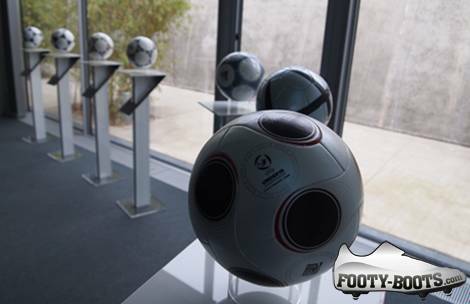 could it be the Europa ball for next year? or the finale ball?